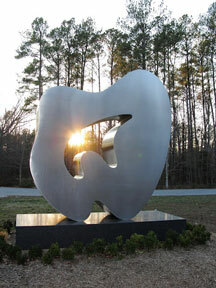 Jean Arp: Oriforme | The Fralin Museum of Art, U.Va. Jean Arp’s Oriforme, on long-term loan from the National Gallery of Art, will be on view on The Joseph and Robert Cornell Memorial Foundation Entrance Plaza in front of The Fralin Museum of Art beginning March 25, 2013. Arp (German-French, 1886–1966) was a major figure in the history of abstract art. Oriforme, conceived and modeled in 1962 and fabricated in 1977, is an example of the general approach to abstraction with which he is most closely associated. In 1936, Alfred Barr, then the head of the department of painting and sculpture at the Museum of Modern Art, labeled this trend “biomorphic abstraction,” meaning abstract form generated from living sources. Arp drew prototypical shapes and structures from the natural forms of animals, vegetables, and human beings. He mined organic life for basic patterns of symmetry, balance, and visual rhythm. Oriforme is one of a series of sculptures that relate simultaneously to the form of the wheel and to the shape of a mouth. The single word in the title is a neologism, an invented term which seems to poetically conflate the words orifice—the point of communication between the surface and a cavity in an animal or plant body—and form. It reappears in the title of a poem by Arp dated between 1961 and 1964, Oriflamme oriforme. The Fralin Museum of Art's programming is made possible by the generous support of The Joseph and Robert Cornell Memorial Foundation. The exhibition is made possible through the generous support of The Fralin Museum of Art Volunteer Board, Albemarle Magazine and Ivy Publications LLC's Charlottesville Welcome Book.